GRONINGEN - The city of Groningen is host for the 16th WCF World Congress. The congress starts on Sunday July 13, 2008 and ends on Thursday July 17, 2008. The preparations for the congress have reached the point where the main lines are final and ready for publishing. With the congress theme Theme and Variations in mind a very attractive and diversified programme has been developed by the Stichting Carillon Congres Groningen 2008 in cooperation with the board of the Nederlandse Klokkenspel-Vereniging. 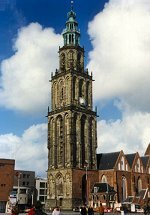 Although the city of Groningen is hosting the congress, with the for the most part historic Hemony carillon in the famous Martini-tower playing an important role, all seven carillons in the province, quite different in character, are included in the programme. Furthermore, at least three travelling carillons will be available. Additional to the usual congress and guild recitals the programme includes a few spectacular concerts for carillon with rock/jazz-band, with electronics and - à quatre mains - with ringing bells. At least seven new compositions will be presented for various instrumental combinations. Three of them will be elucidated during an interpretation afternoon. Sheet music will be available for free. There will be three excursions to carillons in the region and to the Bell-foundry Museum in Heiligerlee. Also some attractive aspects of the cultural heritage of Groningen will be visited like, for example, some of the world famous church organs. On the main square of Groningen an open air bell-founding event has been scheduled. During the congress, and also previously and afterwards, there will be possibilities for individuals to play the carillons and organs. Sixteen lectures on very different subjects can be expected in five categories: campanology, musicology, education, history and organisation. Besides these topics there will be introductions on two aspects of carillon culture as a start to a possible WCF standard: carillon education and carillon construction. Some of the proposed lectures are: Thiemo Wind | Jacob van Eyck, Frank Deleu | Manuscript paper Hendrick Claes (ca. 1630), Carl Van Eyndhoven | 'A la recherche du temps perdu' - A Reconstruction of Improvisation Practice by 18c. Carillonneurs, Linda Pointer | Carillon Education in the USA, Ana, Sara, Albert Elias | Guidelines for advisors of carillon projects, Tin-Shi Tam | Music for carillon and orchestra, Bert Schoofs | Two new designs of major third bells, Koen Van Assche | Carillon playing: the impact of the use of different playing techniques, Geoff Armitage | British bell-founders and modern bell-tuning. The location for most of the meetings and lectures is the Academy Building of the State University of Groningen. The adjacent tower of the university houses a small 25-bell carillon with bells in major-third tuning. The offered hotels are of good quality and a variety in pricing. They are all on walking distance of the Academy Building. Please register using the website of the congress: www.carillon2008.nl. On this website also a lot of information about the various carillons, the congress locations, and the hotels can be found. The Groningen Congress Bureau is taking care of a correct registration. The congress fee includes all lunches, coffee/tea, excursions, concerts, the congress banquet, a congress book and a congress report. Up to April 15th for everyone the reduced congress fee is EUR 180. After that date the fee is EUR 210. Sunday, July 13 - Congress registration | Bell ringing | Opening concert on the Martini carillon by Bernard Winsemius | General Assembly | Reception by the Queens Commissioner, the Mayor of Groningen, and the Rector of the University | Guild concerts | Service in the Martini Church | Concert on the famous organ of that church. Monday, July 14 - Lectures | Excursion to Middelstum: Hemony carillon, lecture about Jacob van Eyck, organ demonstration | Uithuizen: Church with Schnitger-organ | Menkemaborg with concert on travelling carillon | Groningen: Spectacular concert with travelling carillon. Tuesday, July 15 - Lectures | Excursion to Winschoten: lectures, concert for carillon and electronics with world premiere of compositions of Jacob ter Veldhuis and Ad Wammes | Veendam: New Petit & Fritsen-carillon, lecture and concert with compositions of Wim Franken | Groningen: Music Shop | Organ recital | Open air bell-founding event with music from the Middle Ages. Wednesday July 16 - Guild concerts | Excursion to Heiligerlee: Guided tour and lecture about the Van Bergen bell-founders in the Bell-foundry Museum | Appingedam: Concert on Taylor-carillon, organ recital, lecture | Groningen: Music Shop | Congress Banquet. Thursday July 17 - Introduction on carillon education and carillon construction | Lectures | Congress photograph | General Assembly | Presentation of three new compositions (sheet music for free) with discussion of interpretations | Congress Concert Martini-tower: Carillon four hands with ringing bells (with world premiere) | Congress Concert: Travelling carillon and fusion band. To prepare the congress a local organizing committee, the Stichting Carillon Congres Groningen 2008, has been established. Both carillonneurs of the city of Groningen, Adolph Rots and Auke de Boer, are members of this committee. The committee has hired a professional Congress Bureau that will take care of hotel reservations and all other logistics. Groningen is the capital city of the province of Groningen in the Netherlands. It is with a population of 185,000 (including approximately 40,000 students) - by far the largest city in that area. The province of Groningen borders in the north the Wadden Sea. The land use around the city of Groningen is mainly agricultural. The province is also well-known because of its large natural gas fields. In the 13th century, when Groningen was an important trade center, a city wall was built. In 1614 the University of Groningen was founded. In the same period the city expanded rapidly and a new city wall was built. That same wall would later, in 1672, be fiercely attacked by the bishop of Münster, but the wall resisted and Groningen kept its freedom. The city did not escape the devastation of the Second World War. Especially the main square, Grote Markt, was largely destroyed in April 1945, at the end of the war. However, the Martini Tower and its church, the 'Goudkantoor' (Gold Office) and the City Hall were not damaged. Although Groningen has a relatively small population for a city, it has a role as the main center of this part of the country, concerning music, arts, education, business and cuisine. The great number of students living in Groningen also contributes to a diverse cultural scene for a city of its size. The most important and most famous museum in Groningen is the 'Groninger Museum'. The city also has its own science museum, a comics museum, a tobacco museum, its own City Theatre (Stadsschouwburg), a big theatre and two major concert venues.